It’s key to keep yourself well-nourished as you adapt to a new routine of feeding and disrupted sleep. It’s the perfect time to celebrate the amazing effort your body has put into growing a human, and to make sure that you’re eating plenty of wholesome, delicious food to speed your recovery. If you’re struggling to find the time to shop and cook, consider a meal delivery service to take the pressure off a little. You could also ask friends and family to take turns whipping up big pots of hearty soup, nutrient-rich salads or comforting casseroles to help keep your strength up. They say “the path of least resistance” is the best way forward, and when you’re a new mum, this could not be more accurate. Trying to cram your drastically transformed life into a tightly structured routine is the sort of ‘square peg, round hole’ dilemma that can spark even more stress. Set your previous expectations of motherhood aside, and instead approach days (and nights!) with your little one as a learning curve for you both. Being flexible in these early weeks will ensure you adapt to your baby’s ever-changing needs as the months roll out. 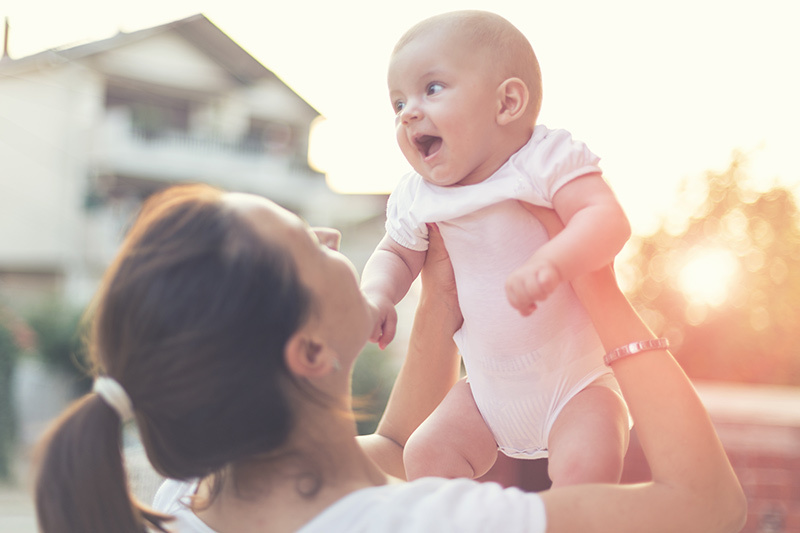 While it can be very tempting to accept every friend or family member’s suggestion that they pop over and see the baby, it’s a great idea to postpone these visits and give yourself time to settle in. Adjusting to the new rhythms of sleeping and feeding are more than a full time job, and it can also be hard to gauge the best time for guests to visit. It’s much better to have one “open afternoon” when everyone can drop by. Then you can spend these precious newborn days with the pressure off, doing things at your own (and your baby’s) pace. Don’t try to ‘do it all’ and run yourself ragged in those early weeks. Instead, start building your village – and welcoming an extra pair of hands or two – from the very get-go. Not only is extra help a godsend when your baby is a newborn, calling on family and friends regularly ensures they’re part of your baby’s trusty inner circle, as they grow up. Let people know the specific things they can do, because sometimes they worry about interfering or doing the wrong thing. Saying things like “please drop nappies on the doorstep on your way home” or “please walk the baby while I take a long bubble bath” are examples of great places to start. It’s also extra important to reach out for expert help if you’re struggling with caring for your baby or generally feeling overwhelmed or unwell. Your GP, midwife or maternal child health nurse are excellent allies for tired new parents and they’re very keen – indeed trained – to assist. Before you have a baby, people warn you about sleep deprivation, but it’s not until after that the reality truly hits home. Create a formal tag team with your partner and your closest friends/family members. Block out time where you can pop the earplugs in, pull the doona up and allow someone else to look after your little one. Also never, ever feel guilty about catching up on much-needed sleep. It’s vital to the optimal functioning of healthy humans, so you’re really doing everyone a favour by having a snooze. While you might not be able to get out every day, even just sitting on the back step sipping a cup of tea can help provide a bolstering reset. It can also remind you there’s a whole world out there to explore, and that you might even dip your toe in the coming days. If you’re finding yourself deflated or even anxious as you scroll through your social media feed, it’s a great idea to unplug for a while. Weed the garden or flip through library books or have a little lie down with your baby instead. And don’t forget that “perfection is the enemy of good.” It’s almost never achieved and gets in the way of having a nice time – and being a relatable and lovely human!